Coin museum of Kerman : It is the largest and most developed city in Kerman Province and the most important city in the southeast of Iran. 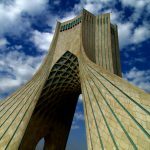 It is also one of the largest cities of Iran in terms of area. Kerman is famous for its long history and strong cultural heritage. The city is home to many historic mosques and Zoroastrian fire temples. Kerman is also on the recent list of the world’s 1000 cleanest cities. Kerman became capital city of Iranian dynasties several times during its history. It is located on a large, flat plain, 800 km (500 mi) south-east of Tehran, the capital of Iran. The city’s many districts are surrounded by mountains that bring variety to Kerman’s year-round weather pattern. The northern part of the city is located in an arid desert area, while the highland of the southern part of the city enjoys a more moderate climate. 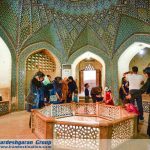 Kerman is among several cites in Iran with a strong cultural heritage, which is expressed in the local accent, poetry, local music, handicrafts and customs that Kerman has introduced to the world. 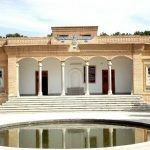 This museum is located to the north of the Ganj Ali Khan square of Kerman. The ceilings and porches of this structure are adorned with beautiful plaster works. In the past the premises was a mint and a government treasury. Internally, the structure is octagonal and comprises of a chamber, four cubicles in four corners. Presently ancient coins are on display here. This building was built by Soltan Mohammad memar Yazdi.